No, what you see above is not the result of an evil exercise in cloning first generation iPod nanos. I do indeed have two. Here's why. Last week after I arrived home from work, I dropped my iPod. It landed butter-side-down on the asphalt driveway with a dull, unassuming thud. Immediate inspection revealed no damage to the exterior, but when I turned it on, only the bottm left quadrant of the screen was working. I had broken my iPod. This was my first MP3 player, bought in the summer of 2006 for the 20-minute bike ride to and from work. Sure, it's only got a gigabyte of storage, but that has always been enough for me. 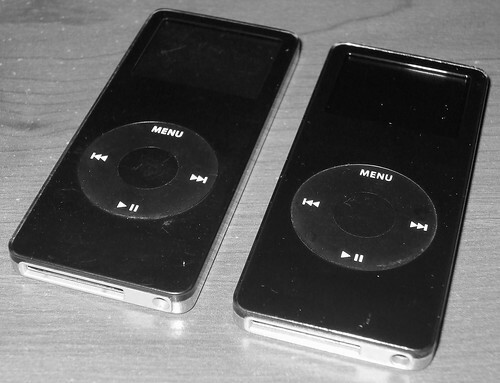 Even as newer models came (and went), I stuck firm to a resolution that I would not upgrade until my iPod itself would no longer do what it was designed to do: play music. Last night, all four of us who work at the front desk went out for dinner and bowling. I don't go out that much--and in fact, I probably spend more time hanging out with these three at work than I do going places with my other friends. But it was Brittany's last weekend in town, because she's biking back home to Guelph next week. So we had one last hurrah--and a little bit more.